Labor Must Join the Fight to Stop the War on Black America! The assassination of the Charleston, South Carolina 9 in bible study at the Mother Emanuel AME Church by a white racist terrorist continues to point out how the corporate owned media and government policies criminalize Black and people of color to make us scapegoats for the deep economic crisis caused by a system of corporate greed. Like the racist terrorist bombing of the 16th Street Baptist Church in Birmingham, Alabama that killed 4 young Black girls and injured 22 others in 1963; Black and people of conscience throughout the U.S. and internationally are rightfully outraged by this criminal attack on the Mother Emanuel AME Church. The mantra by those who oppose labor rights, voting rights, women’s rights, LGBT rights, quality public education, expanding Medicare and living wages, that this act of racist terror has brought people in South Carolina closer together, symbolized by taking down the confederate flag, does not address the real issues and the forces that devalue Black lives and divide the people. It is no coincidence that Dylan Roof chose the Mother Emanuel AME church to carry out his racist terror. This church represents a historical place where people of conscience meet to organize and plan the struggles against injustice and for Freedom; a legacy left by Denmark Vesey a founder of Mother Emanuel AME who gave his life in the Black Freedom Struggle. Racism is more than negative thoughts in white folk’s heads. It is part of an organized system of capitalism that devalues anything for profits, not only in the U.S. but globally. The extrajudicial police and vigilante killings of unarmed Black people every 28 hours, and the failure of the courts to convict these killers, sends a racist message that the government devalues Black lives. Young Black and people of conscience across the country are rebelling against this economic and politically driven racist climate that has declared War on Black people in the form of economic, political and social violence – the police killings, high unemployment, attacks on public education, environmental racism, mass incarceration, gentrification, low wages and attacks on worker, women, union and human rights. In addition to being the conditions of an oppressed people; they are the conditions of the most impacted section of the working-class. To challenge and defeat this racist system, the power of the people, especially the Black and general working-class must be organized and mobilized against the economic and political forces and system that places profits over human needs and rights. The last 7 years has made clear, that without the organized power of the people, especially the Black and general working-class, that elected officials at best, try to exercise power within a system dominated by the corporate power of the 1-percent. Most unfortunately follow the dictates of big money. 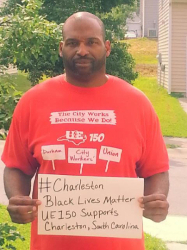 Just as the ILA 1422 struggle for labor rights built a national and international movement that demanded and won the Freedom of the Charleston 5, all workers must utilize the Days of Grace/Rage mobilization to inspire all of labor to mobilize their power to stop this War on Black America and the working-class! End Racism and Police Terror! Raise the minimum wage to $15/hour! Overturn RIGHT TO WORK LAWS! REPEAL TAFT HARTLEY! Gov’t funding for full employment, not for war! Single Payer National Health Care for All! Repeal bans on Collective Bargaining Rights for All Public Workers! Free education through college, abolish student debt! To learn more about the SWA contingent or to help us build a labor presence, please contact us at info@southernworker.org or 252-314-2363. 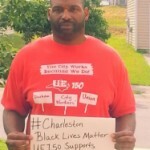 The response to the call for Charleston’s Days of Grace issued by the International Longeshoremen’s Association Local 1422 has been tremendous.